Organizations should consider the benefits and limitations of a multi-cloud strategy when it comes to managing business data. No matter how many or which vendors are decided, it is important to set clear goals and define a path to implementation to reduce complexities. In this week’s exclusive editorial, we discuss multi-cloud strategies for BI. For the latest industry news, current editorials, links to our Buyers Guide and Software 500, and more, visit softwaremag.com. Follow us on Twitter and visit our website for the latest industry news. Also, check out the November digital edition. Receive the SoftwareGram weekly! Add or update your subscription. Click on the below links to reach SWmagdirect.com, our information portal, and learn about new products and services from leading vendors. 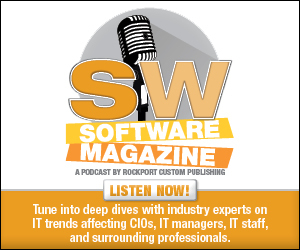 Tune in to the official Software Magazine Podcast for deep dives with industry experts on IT trends affecting CIOs, IT managers, IT staff, and surrounding professionals. Click here to listen. Software Magazine’s Buyers’ Guide is available online 24/7 to provide you with information on companies and their products when you need it. Click here to directly visit the guide! Editorial Mission: Softwaremag.com, the IT Software Journal, is focused on pointing the CIOs, IT managers, IT staff, and surrounding professionals to the product and service options available to help them address their business challenges. We do this through the Software 500 revenue-based ranking of the leading software and service providers worldwide, and through our editorial features, columns, and new product coverage, and associated Buyers Guides, across our editorial focus areas. Copyright 2019 Software Magazine. All rights reserved.